Following a certain keyword or a search term on Twitter can be useful for multiple reasons. For example, we can understand how people reacted to a particular event, follow news on a certain topic, know what people say about a brand, find all job postings in our area or know about the latest giveaways of our favorite software. Everything that gets written most probably will get tweeted. Therefore, Twitter is the best place to follow latest trends and conversations on any topic. You don't have to have a Twitter account in order to follow keywords on Twitter, but it definitely is desirable. Let's have a look at some of the best ways to track Twitter search terms. Go to Twitter search, enter a desired keyword and follow its mentions. You can also refine your search results by using many criteria like people or places. If you have a Twitter account, you can even save your searches. Additionally, you can also see tweets posted near your area or by the people you follow. TweetDeck is a Twitter owned social media dashboard application for management of Twitter accounts and is the best option when it comes to following search terms. It supports tracking of multiple keywords and following searches in the form of columns. To use TweetDeck, you need to have a Twitter account. To follow any keyword on TweetDeck, search for it and click Add Column that comes at the bottom of Search popup. TweetDeck allows you to filter searches to include tweets written in a particular language, include or exclude tweets containing certain keywords, and to decide whether you want to include retweets or not. You can also filter searches on the basis of users to include tweets posted by a particular user on a particular topic. You can also decide whether you want to include tweets posted by verified users only. 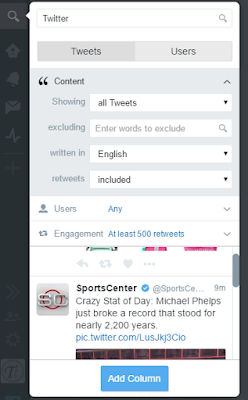 You can also filter searches to include tweets that have been retweeted, liked or replied to more than a certain number of times to find which tweets are attracting people's attention. Once a column is added, you can select whether you wish to be alerted once a new tweet is posted fulfilling all the criteria that you have selected. You can either chose to get alerted by sounds or in the form of Desktop notifications. Aside from the web app, TweetDeck is also available as an app for Chrome.